Make a splash on the UK’s only solar powered water ride, SolarSplash. Jump aboard the world’s first people powered roller coaster or zoom down the longest sledge run in Wales! Children will love discovering the super bouncy Giant Jumper, exploring the turrets of TreeTop Towers, taking their shoes and socks off for the BareFoot Trail or aiming for gold at Archery. Open daily at 10am from and with an onsite café and free parking, GreenWood Forest Park is situated at Y Felinheli, Gwynedd. SAT NAV – LL55 3AD. 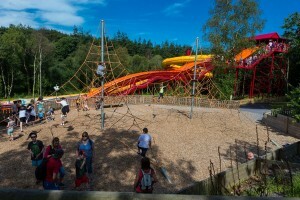 For more information visit www.greenwoodforestpark.co.uk or call the 24 hour info line on 01248 670 076.